Brian Joss – The Peugeot Groupe increased their sales for the fifth year in a row despite economic and geopolitical turmoil. Groupe PSA said their core model strategy was a trigger for their success. This profitable growth, reaching 3 878 000 units, has been leveraged by Groupe PSA product offensive with more than 70 regional launches in two years and commercial network commitment. Europe: Change of scale with 17.1% market share: Groupe PSA took full advantage of its perfectly managed new WLTP standard implementation phase to gain a competitive edge in the last four months of the year. Group market share reaches 17.1% by end 2018, up +3.8 pt, underpinned by Peugeot and Citroën brands that are the best progressing brands in 2018, with almost +5% sales increase for both brands among the top 10 brands in Europe. France (+2.6 pt), Spain (+4.2 pt), Italy (+3.9 pt), Great Britain (+4.8 pt), Germany (+3.7 pt). Middle East – Africa: the Group remains offensive in a chaotic regional context. 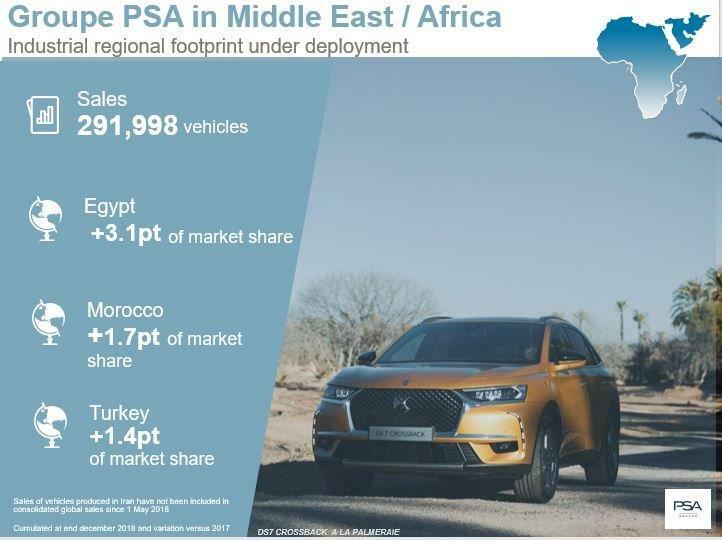 Despite strong headwinds mainly due to wind down in Iran and Turkish market downturn, Groupe PSA market share increased in Morocco (+1.7pt), Tunisia (+1pt) and Egypt (+3.1pt) and the Group remains market leader in French overseas departments. In a declining Chinese passenger vehicle market (-2%), sales are down 34.2%. The Group is working on action plans with its partners to tackle current issues. The Group is implementing its electrification strategy with the Fukang brand, followed by PCD electrified models from 2019 onwards. Moreover, the core model strategy is under execution to propose a product offering designed for Chinese clients. Sales in South East Asia doubled versus 2017, amounting to 10,882 vehicles. The joint venture with Naza Corporation Holdings (Malaysia) will start delivering its first productions in 2019 with the Peugeot 3008 and 5008. The launch of the new C4 Cactus SUV industrialised in the region, is encouraging. The local manufacturing of the LCV range is in process (launch of the Jumpy MiniBus version, Berlingo, Boxer and Jumper in Brazil, Jumpy and Expert Crewcab in Argentina and the electric Partner in Chile and Uruguay). “In an increasingly unstable environment, we thrived with the rigorous execution of our efficient core model strategy. The product appeal to our B2B or B2C customers supports our pricing power policy for all of our brands, while we are currently implementing our electrified offensive. Agility and Darwinian spirit are more than ever important to tackle forthcoming challenges and enhance our customer satisfaction,” comments Carlos Tavares, Chairman of the Managing Board of Groupe PSA.